5th Anniversary Annual Meeting Is Big Success -- About 50 people attended the meeting and club ride to Huddles. A slide show of the club’s first 5 years was shown. Andy Becker was elected to the club board. We sold over $1900 in Polaris-donated helmets, accessories and club gear. 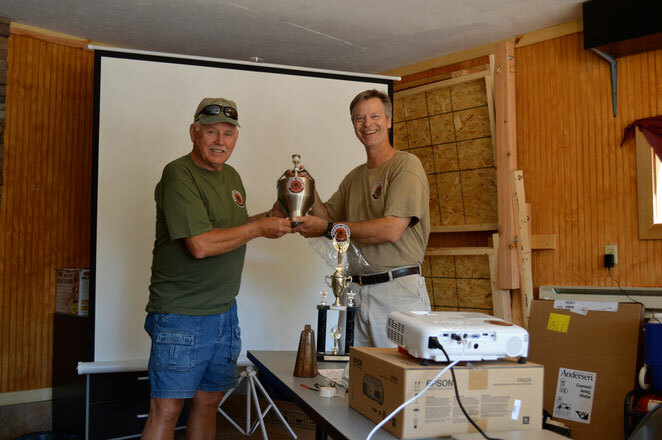 Lewie Schrupp was awarded the highly coveted “Top Salesman” trophy and the club’s new stainless steel pancake batter dropper, for his outstanding contributions keeping members well fed and attracting new members with the spring pancake breakfast and the bullhead feed held at the American Legion earlier this year. Club Brings Safety Trailer To Hackensack ‘National Night Out’ -- Thanks to the Buches and the Vanselows for setting up the trailer and passing out maps, reg books and ATV safety color books to families, in Hackensack on August 5th. Sheriff’s Department Considering Starting An ATV Posse -- Sheriff Tom Burch would like to work with the club to create an ATV posse. Members would attend a meeting and be asked to help with searches for missing persons. Many members indicated their interest at the annual meeting. If you would like to be added to the list and contacted to attend an informational meeting in the future, simply reply to this email with your name. Sorry We Had To Cancel August Ride -- Due to medical issues and scheduling conflicts, we weren’t able to hold the August 9 ride at Moose River ATV Trail. Our apologies. We can schedule more rides! If you would like to lead a local ride on a weekday or Saturday at a trail system in the area, please shoot an email to Dave Halsey and he’ll send out an email to all members. Club Prez and Treasurer Updates -- Dave Halsey had 2 eye surgeries in the past 2 weeks for a detached retina. Mike Ebinger is looking at 2 possible surgeries on his digestive tract. Neither will be riding for a bit while they are healing up. Both thank you for your understanding and support. August 26th -- Woodticks At The State Fair -- Tuesday August 26th is Trails Day at the DNR Building. If you’re at the State Fair that day be sure to stop by and say hi to club members who are working as volunteers operating the DNR ATV Simulator. Last year we had over 200 kids ride it in one day, and talked to many parents about ATV safety. Thanks to this year’s volunteers: John Dickerman, Tony Bluth, Mike Burress, Richard Thompson. September 19-20 -- Overnight Club Ride in Roseau -- This will be a fun ride. It’s the ATVAM Fall Ride & Rally. Some members already have motel reservations in Roseau and Warroad, or are camping at the Roseau campground. 1) Drive to Roseau Thursday or early Friday for the ATVAM VIP Ride. Friday Schedule: 9-10 a.m. Arrive at Polaris plant (301 5th Ave. SW); 10-11 a.m. Polaris factory tour and presentation; 11 a.m. - noon Travel to trail; Noon - 1 p.m Lunch provided at the trail; 1-4 p.m. Ride the Bemis Hill trail system. RSVP for Friday VIP ride (for lunch count) by contacting Jonathan Bohn: jonathan@goffpublic.com or 651-815-1196. 2) Drive to Roseau Friday afternoon or early Saturday. Register for Saturday ride at Brickhouse Bar & Grill (205 5th Ave. SW, next to Polaris factory) from 8:30 a.m. on. Guided rides and general riding at Bemis Hill all day. 5 p.m. social hour at Brickhouse, come as you are! 6:00 p.m. ATVAM Banquet. 6:30 p.m. general membership meeting & election of ATVAM officers, plus silent and live auctions of ATV items. Ride & Rally Registration for ATVAM members: $25 single / $50 family (includes 2 non-adult children under 18, additional children $10 each). For non-members: $45 single / $70 family (both include 1-year ATVAM membership). Questions or to arrange meeting up with other club members in Roseau -- Contact Dave (dvhalsey@aol.com) 612-723-1987 or John Dickerman 507-317-7711. September 26-27 -- Club Trailer & Youth Vehicles at Hackensack Chainsaw Event. All members are invited to visit the trailer and help for a few hours by passing out trail maps, reg books and safety materials. Kids will be invited to sit on club ATV and dirt bike, and wear helmets and safety gear, but not start the vehicles. 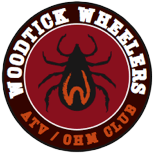 October 4 -- Club Ride & Poker Run To Huddles (with valuable prizes!) -- Followed by Adopt-A-Highway Cleanup (need 12 volunteers, takes about an hour). October 11 -- ATV Youth Safety Class, 9 a.m., at the WACC. This ATV training class is for operators ages 11-15. Students who are age 11 may take the complete course, but the certificate will only become valid when they reach their 12th birthday. Adults who are new to ATV riding are also encouraged to take the class. The Minnesota DNR reports a rise in the number of injury accidents among older adults who are riding ATVs for the first time. Class requirements: Prior to the class, students must complete the DNR’s independent study ATV CD-ROM, and bring a certificate of completion to the class. CDs are available from our club’s instructors, at the One Stop in Longville, or by calling DNR Enforcement Safety Training Office at 800-366-8917. Those attending the class must provide their own ATV, wear long pants, long-sleeve shirt, gloves and boots (no tennis shoes) and bring a helmet with goggles or face shield. Parents must sign a parent release form, and are encouraged to help with the class. Preregistration is required. To register, contact Lloyd Solarz at 218-682-3775. Dues Renewal -- If you haven’t mailed your renewal dues for 2014, please help us finish that effort. Thanks! Thanks to all our Business Members for your support! Please give them your business. They are: 1st National Bank of Walker, Ace Hardware & Lumber, Legion Post 202, Arrowhead Builders Supply, Bear Pause Theater, Birch Lake Small Engine, Birchwood Char House and Bar, Birdie’s Mini Golf, Focalpoint Flooring, Gallery of New Creations, Hackensack Auto Value, Hackensack Lumber, Hartmann Recycling, Hilltop Sports, Huddles Resort, Kevin Larson Construction, Longville Motel, Lori’s Luv’s, Luccette’s Pizza, Mark’s Market, Netter, North Country Tire, North Lakes Marine, Oakwood Insurance Agency, Southside Fuel Plus, Stompin’ Grounds, The One Stop, Tranquility Acres, Udoms Thai Restaurant, Walker Power Equipment. Watch for updates on emails, club website & Facebook. Suggestions, new club ideas? Reply to this email.